There were 2 slightly separate projects I worked on with the help of my E-Learning Assistant, Anousha Bonnemaison. So far, French I students had 10 fifteen minute-long written grammar tests (every other week) in the hour of French I dedicated to grammar. These regular short tests are an important part of the learning process but they take up valuable contact time, which could be used for more class activities or for tailored explanations from the teacher. Students wishing to study French language in the French department need to have reached a certain level of competency. We do have specific entry requirements for French I, II and III but some students haven’t got the qualifications required because they studied outside the UK or are heritage speakers or have learnt French independently or with a private tutor or have lived in a French-speaking country for a while, etc. We currently ask such students to sit a French language diagnostic test in welcome/induction week (week 0). The purpose of this test is to assess students’ current language abilities in order to match them to the course most suitable to their level. As research shows, accurate initial placement is a key factor in successfully learning a foreign language. Unfortunately, the majority of students interested in registering for a French language module in the French department miss this diagnostic test because they haven’t been told about it early enough (these students often come from other schools) or decided to register for one of our language modules after the test took place. This means that I then need to see all these individuals one by one and to assess their level of French as I’m the French language. This doesn’t seem to be a very effective use of time, especially at such a busy time (i.e the beginning of term). 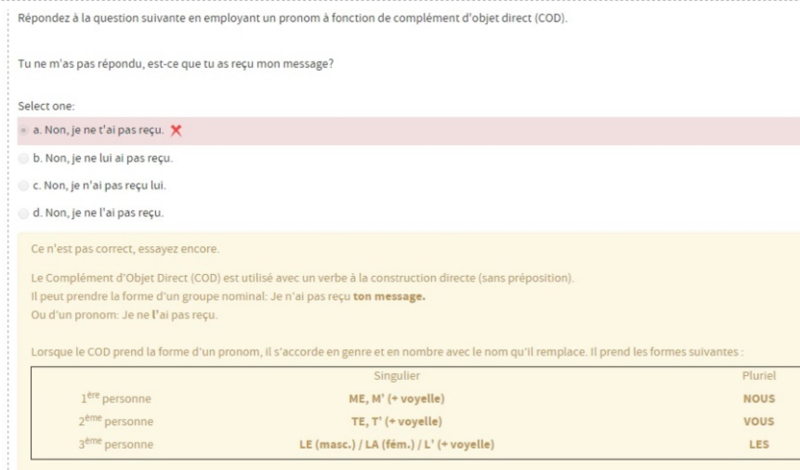 The existence of an online French language entry test would make things much easier. Indeed, students could be asked to go online to take the evaluation test, which would get automatically corrected (at least partly). I could then access the results and if necessary review students’ answers for borderline cases. Unlike the FRE411 French I grammar tests, a single attempt only would be permitted. This diagnostic test would have to be completed in an hour. Students could get referred to the online entry test as soon as they mention their interest in taking a French language module and they wouldn’t need to wait to see the French language coordinator. Their adviser could instruct them to take the test first, or one of the School’s administrators. I would get informed of anyone taking the test and could take it from there. It would allow for more efficient self-testing. The 10 grammar quizzes were created using the current in-class tests as a basis. The E-Learning Assistant also carried out extra research on existing quizzes on the Internet to get a better idea of different exercise types and formats, she also came up with her own questions. This allowed her to avoid any redundancy in the questions set to students and to cover the maximum of possible answers within one test. She tried to vary the kind of questions used to make the most of the great number of options when creating a quiz on QMplus, and to avoid boring students. However, we still wanted to retain an element of familiarity within each quiz, so that students don’t have to think too much about the instructions for each new test and so that the feel of our quizzes as a user was the same throughout. We also found it was important to group the same types of questions together, to avoid confusing our students. We thus decided to stick to no more than 2 or 3 kinds of questions within one test, but to create different questions from one test to another. Moreover, the type of questions depend on the topic of the test. Indeed, when it comes to object pronouns or to the negative form, one of the challenges for students is to be able to place the pronoun(s) or the negation(s) at the right place in the sentence: we thus used ordering questions. As for the topics related to tenses, students have to be able to use the right tense and to conjugate it correctly: we decided to use short answer questions or multiple choices questions in such cases. We wanted to make the quizzes as interactive and pleasant as a grammar test can be. Anousha tried to insert touches of humour in our grammatical sentences, and used contexts our students could hopefully relate to. In the last test, Anousha also added some pictures to explain the context of the sentences. Following my instructions, Anousha provided students with specific detailed feedback for every question. To do so, she used the current grammar lessons, to ensure consistency. 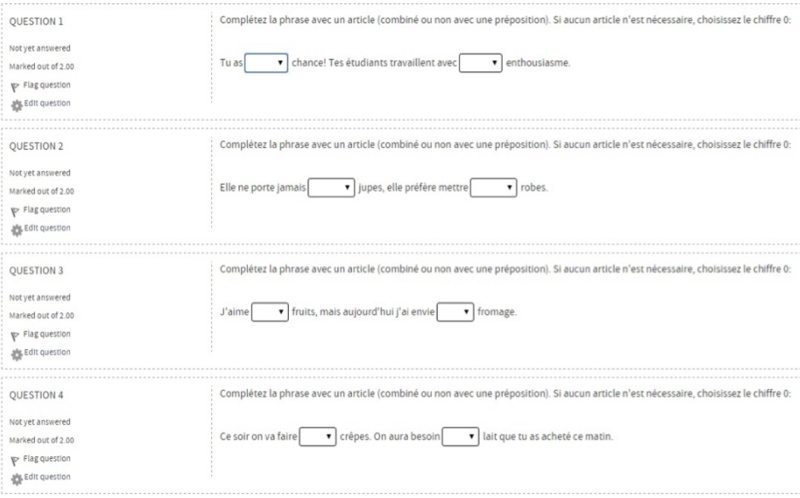 She also sometimes asked her colleagues for help or advice as they are experienced French grammar teachers, or researched the Internet for certain specific points she wasn’t sure how to explain (see Figures 6, 7 and 8 for examples of feedback). To create the diagnostic test, Anousha used the question bank. I gave her the existing paper placement test and she transferred it online. Some changes had to be made. She had to create 9 grammatical sections and 1 essay section. She chose the questions that seemed the most relevant for a diagnostic test, and imported them from the question bank. To do so, she clicked on “edit quiz” and choose “add – from question bank”, as shown on the figure below. Can I enlarge the size of the gap when I create a “gapfill” question? The size of a gap corresponds to the amount of characters you are supposed to write in this gap. For example, if the expected answer is “a cat”, writing “three elephants” won’t fit in the gap. The students can then have a clue that it is not the right answer, as it doesn’t fit properly. To avoid this, it is possible to choose the option “fixed gap size” when editing the question. This fixed size corresponds to the size of the longest answer within the questions. For example, if there are two gaps, one with “a cat” and one with “three elephants”, the size of the two gaps will be the same, and big enough to fit “three elephants”. Before submitting their answers, are students able to review their answers and modify them if necessary? Yes, if the “deferred feedback” is chosen in the “question behavior” within the Quiz settings. Once the students submitted their answers: Is it possible for them to only redo the questions they had wrong, instead of retaking the whole test?